Barnett 643. 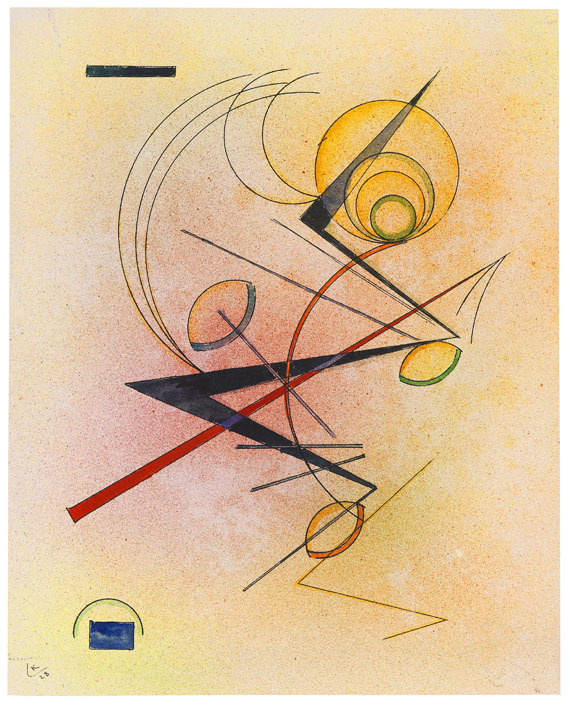 Kandinsky house catalog, watercolors "VII 1923, 90, Gewebe". Monogrammed and dated lower left. Verso inscribed "Nº90./ 1923". On slightly structured paper. 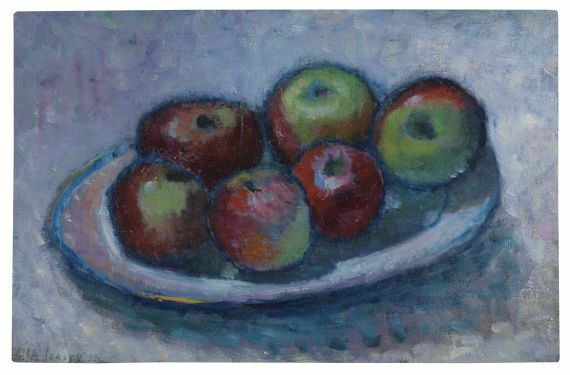 36,4 x 25,2 cm (14,3 x 9,9 in). Unusually fresh and well-preserved. 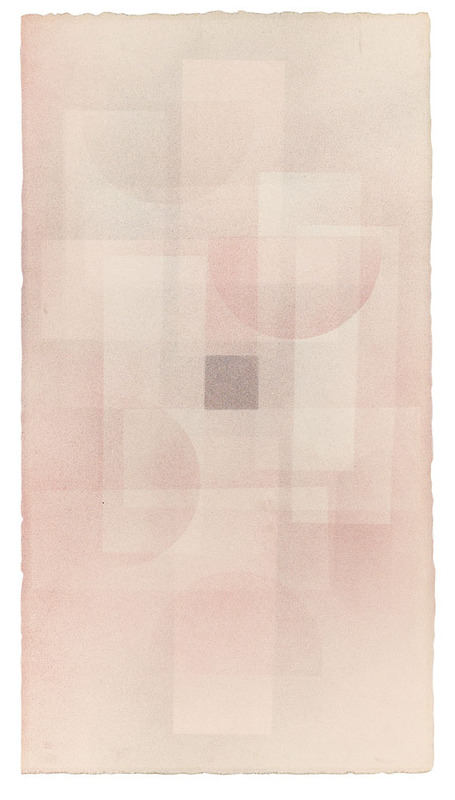 The strictly geometric compositions from the 1920s, of which most are in possession of important public and private collections, are considered the artist's most sought-after paper works on the international auction market. 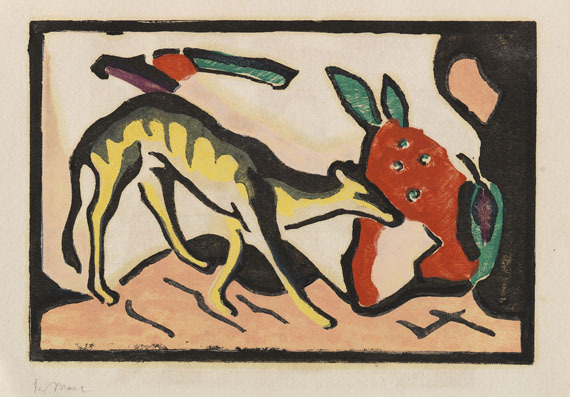 PROVENANCE: In 1930 acquired for the Kandinsky Gesellschaft by Richard Doetsch-Benziger, Basel. 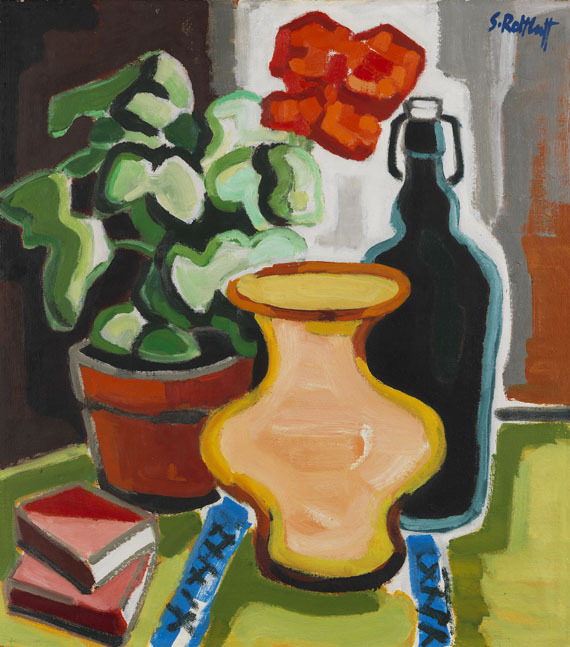 Auction Sotheby's, London 3 July, 1974, cat no. 162 (with illu. in colors). Roman Norbert Ketterer, Stuttgart 1975. 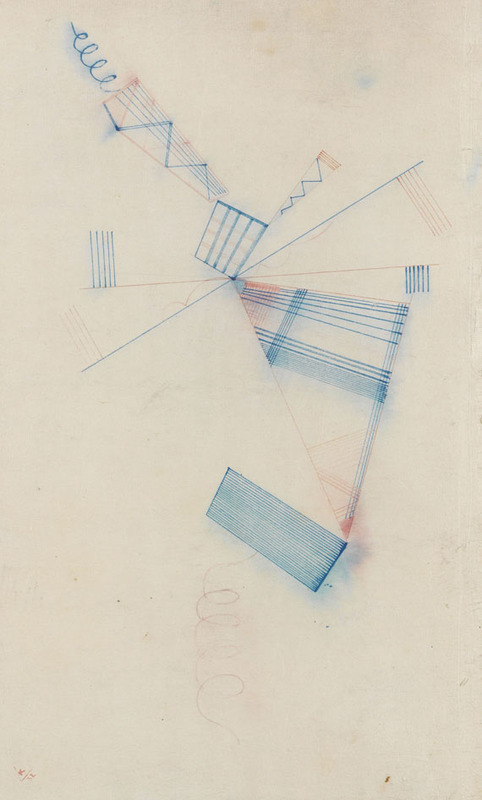 EXHIBITION: Das staatliche Bauhaus Weimar 1919-1923. 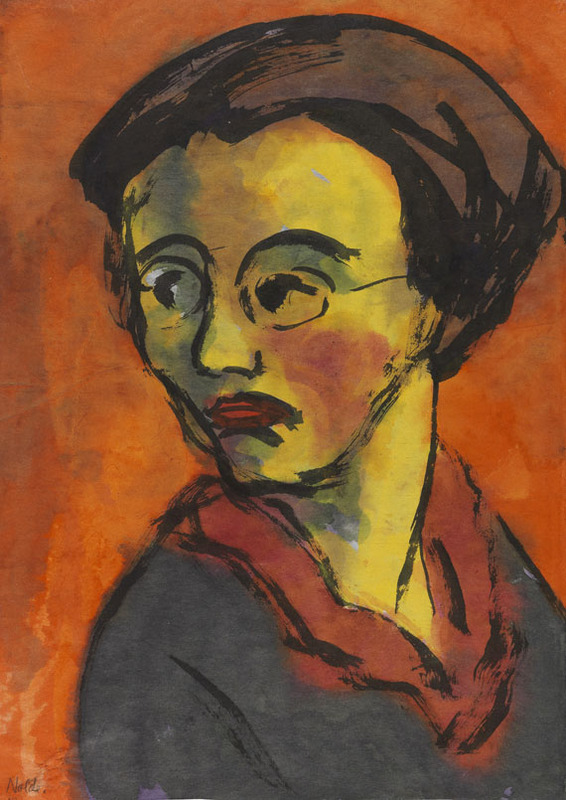 Bauhausausstellung, Staatliches Bauhaus Weimar und Landesmuseum, 15 August - 30 September, 1923. 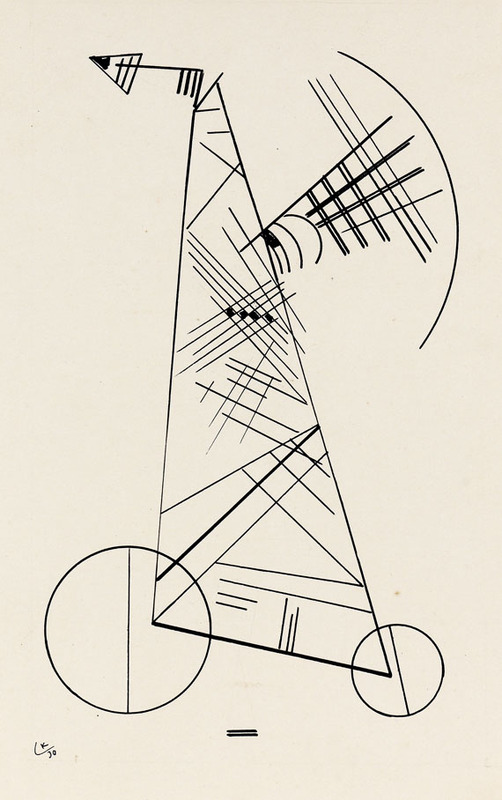 Wassily Kandinsky, Retrospektive. Hallischer Kunstverein and Städtisches Museum Moritzburg, Roter Turm, 4 - 23 October, 1929. 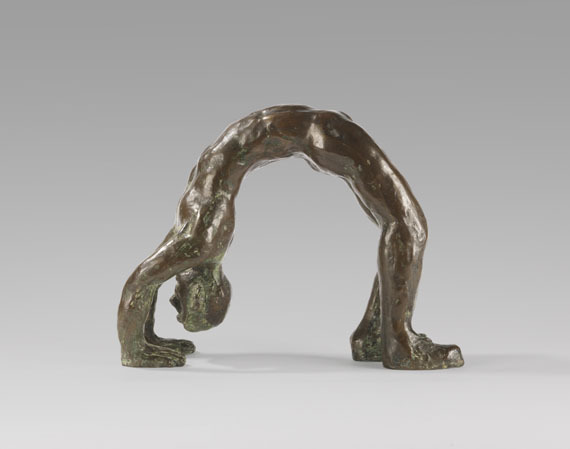 Moderne deutsche Malerei aus Privatbesitz, Kunsthalle Basel, October, 1933, no. 50. 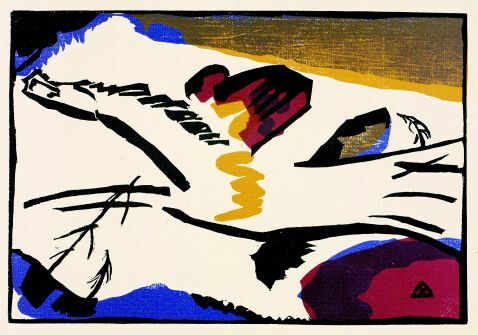 Commemorative exhibition Wassily Kandinsky, Kunsthalle Basel, 10 March - 8 April, 1945, no. 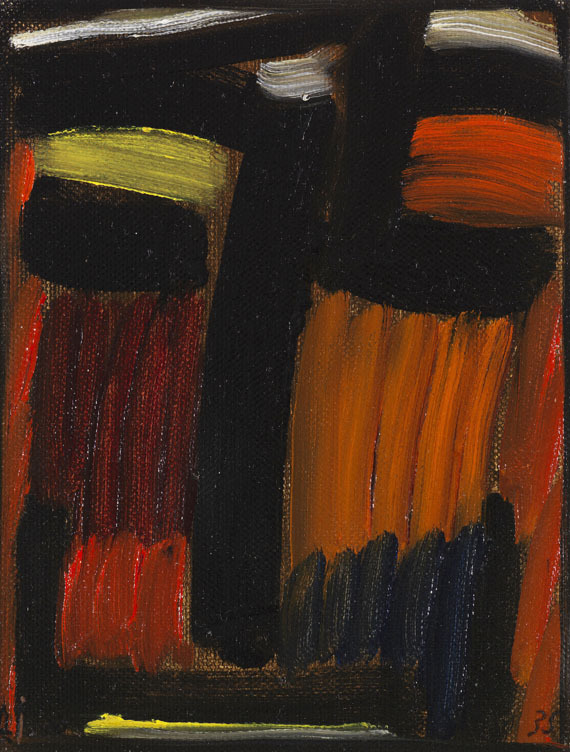 58.
collection Richard Doetsch-Benziger, Kunstmuseum Basel, 9 June - 8 July, 1956, no. 121. 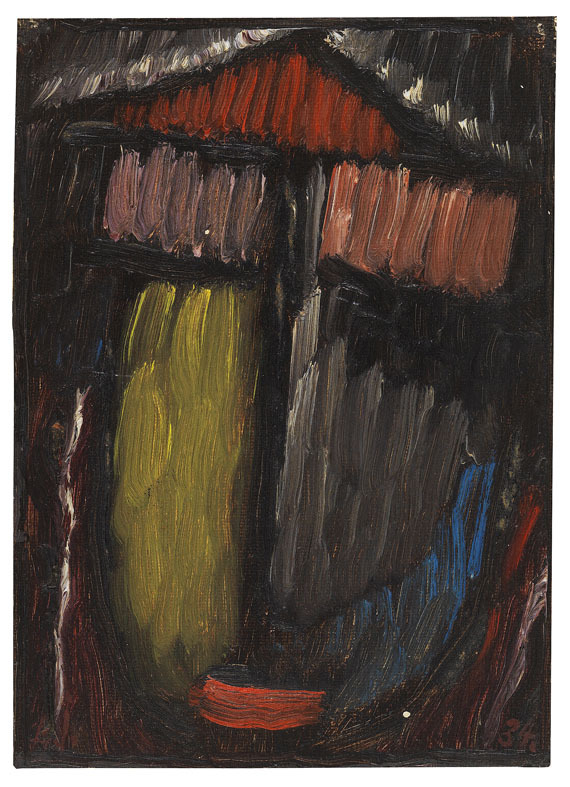 Klee und Kandinsky: Erinnerungen an eine Künstlerfreundschaft, Staatsgalerie Stuttgart, 6 May - 29 July, 1979, no. 78. Kandinsky was born in Moscow on 4 December 1866. 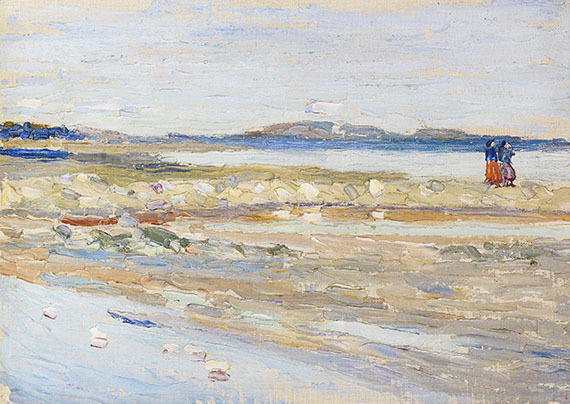 After studying law and economics in Moscow he decided to become a painter and moved to Munich in 1896. Here he began studying at Anton Azbè's art school, then went to Franz von Stuck who trained him from 1900 to 1901 and finally, completed his studies at the Munich Kunstakademie. 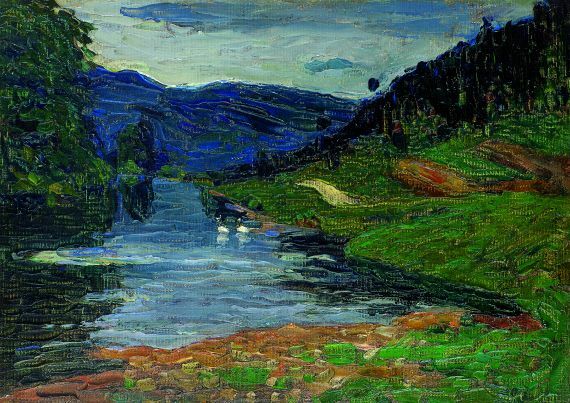 As early as 1902 he was already teaching at the 'Phalanx-Malschule' and soon became the president of the artist group. 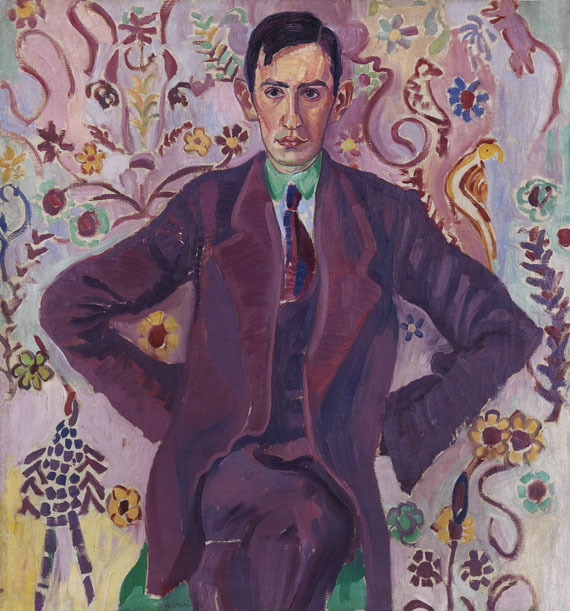 Here he met Gabriele Münter who was one of his pupils in his painting class. They went on extensive trips abroad together and then moved into a shared apartment in Munich in 1908. 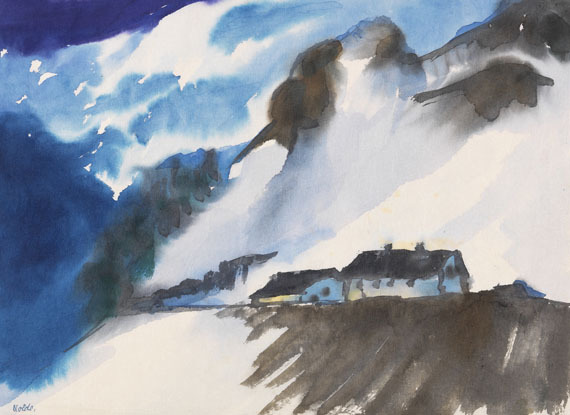 An educational journey to Murnau in Upper Bavaria impressed Münter so much that she bought a house here where she and Kandinsky would spend many summers working intensely. 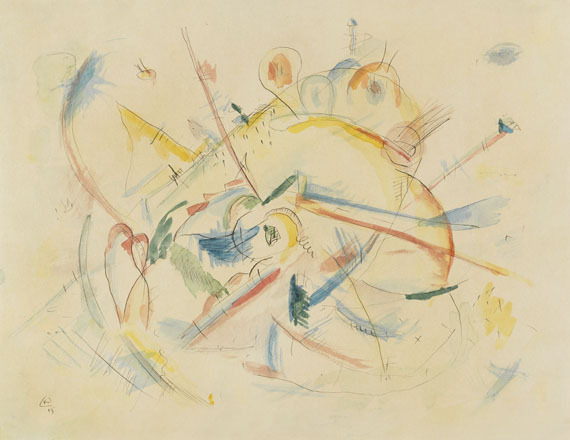 Kandinsky was one of the founding members of the 'Neue Künstlervereinigung' in 1909, and one year later, in 1910, he made his first purely abstract watercolor. This revolutionary step towards abstraction was justified in his book 'Über das Geistige in der Kunst' which Kandinsky published in 1912. 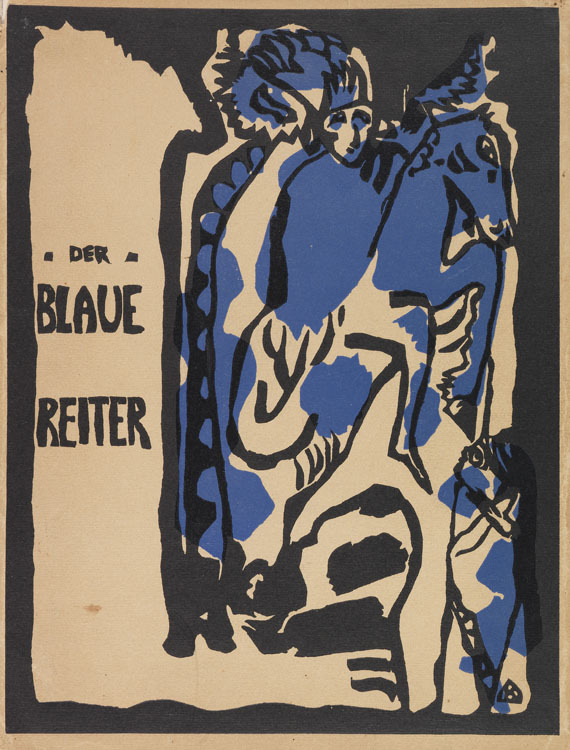 Together with his artist friends Paul Klee, August Macke and Franz Marc Kandinsky founded the 'Blauer Reiter' in 1912 and published the almanac with the same name together with Marc. 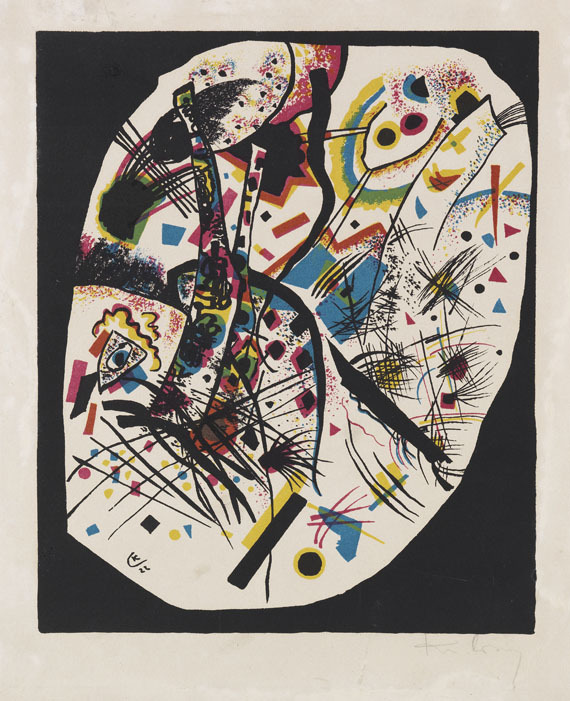 Kandinsky spent the years of the First World War in Moscow, but returned to Germany in 1921. Walter Gropius invited him to teach at the Bauhaus in Weimar in 1922. 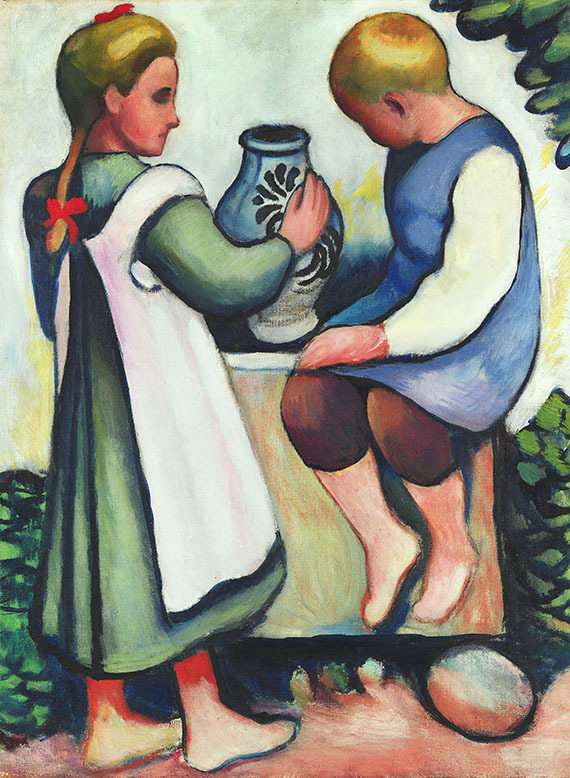 Despite all abstraction, the lyrical-musical power of this work is easily comprehensible. Aloof the title, Kandinsky seems to walk beaten tracksin the variation of familiar pictorial elements. 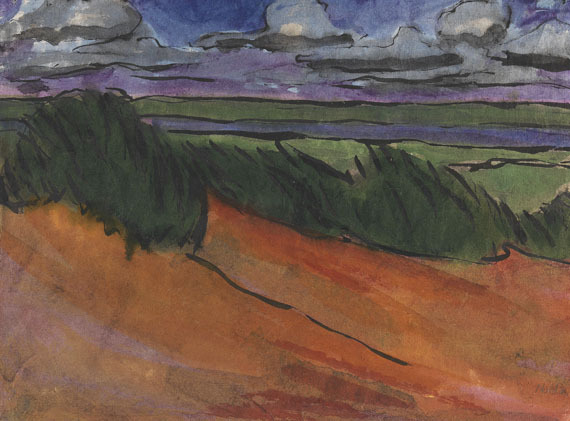 The clarity of the color fields strikes the most, they make for the composition's core, which is broken up and extended by a soft modulation of the watercolor along the lines in India ink. 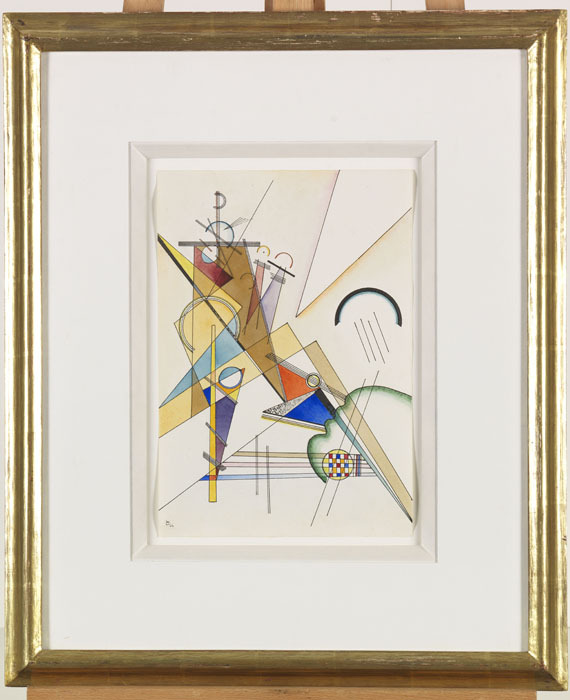 The orderly chaos is the works' tenor, which left clear traces all the way into the decorative commercial art of the twenties. Thelyrical, almost romantic moment is owed to the arrangement of details among each other. 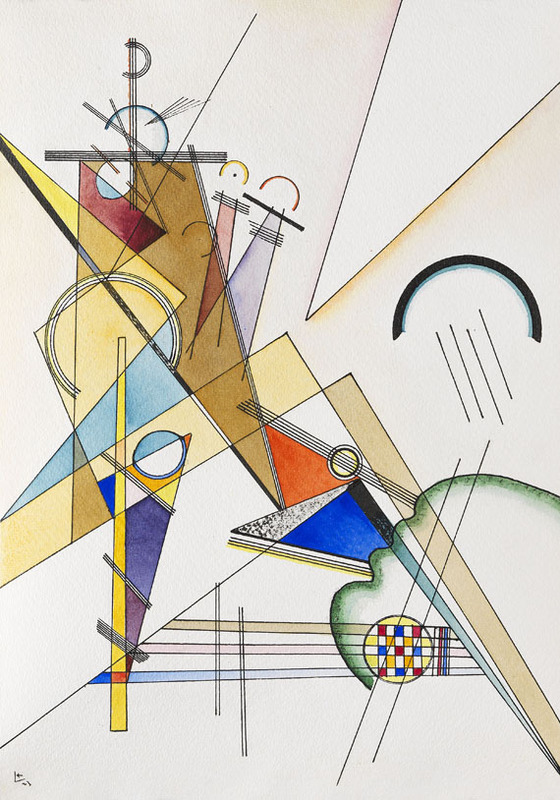 Kandinsky's compositionsavoid any sharp opticalconfrontation. Despite all apparent rationality, their overall effect is somewhat enigmatic. The message is obvious, its content remains a secret. 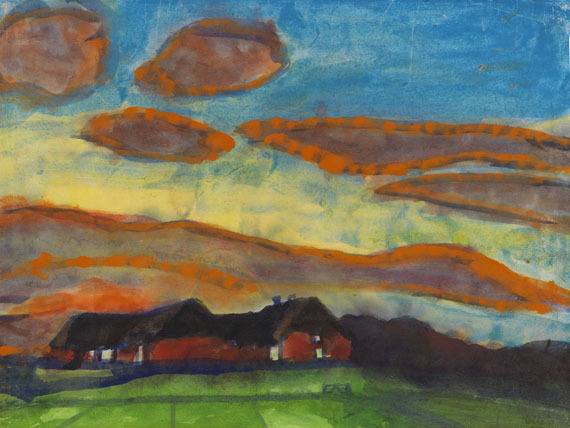 , where he founded the artist group 'Die Blauen Vier' together with Paul Klee, Lyonel Feininger and Alexej von Jawlensky in 1924. 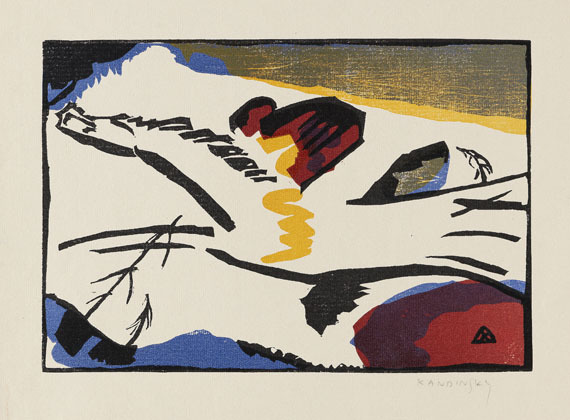 Kandinsky took on German citizenship in 1928. The Bauhaus, which had already moved to Dessau in 1925, moved once again in 1932, this time to Berlin, where it re-opened in spite of Nazi persecution, but had to close its doors permanently one year later. 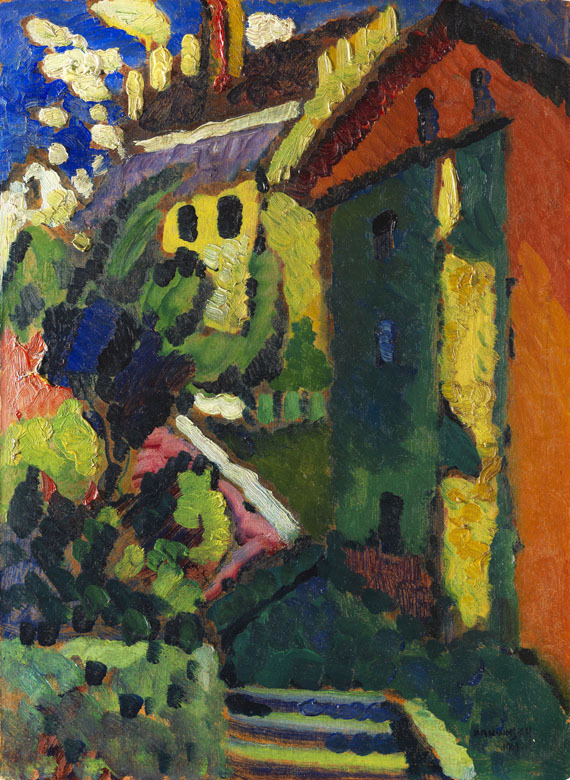 Kandinsky emigrated to France in 1934 and settled in Neuilly-sur-Seine near Paris. 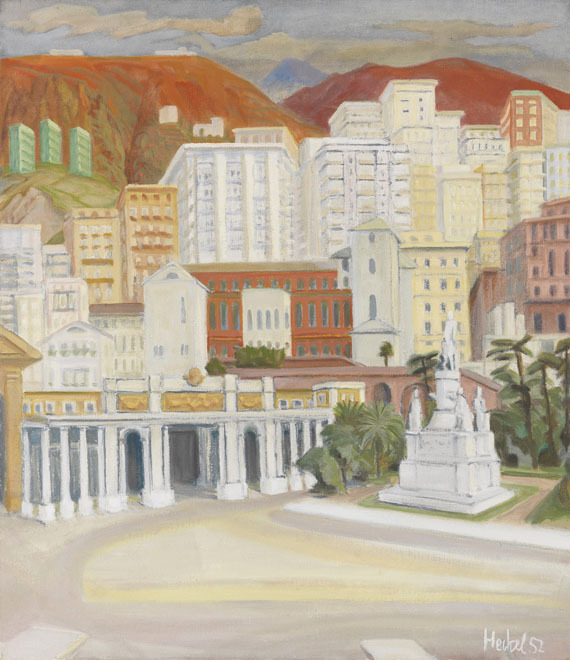 He adopted French citizenship shortly before the outbreak of the Second World War. He continued working during the period of German occupation, in spite of the dangerous situation, until shortly before his death. 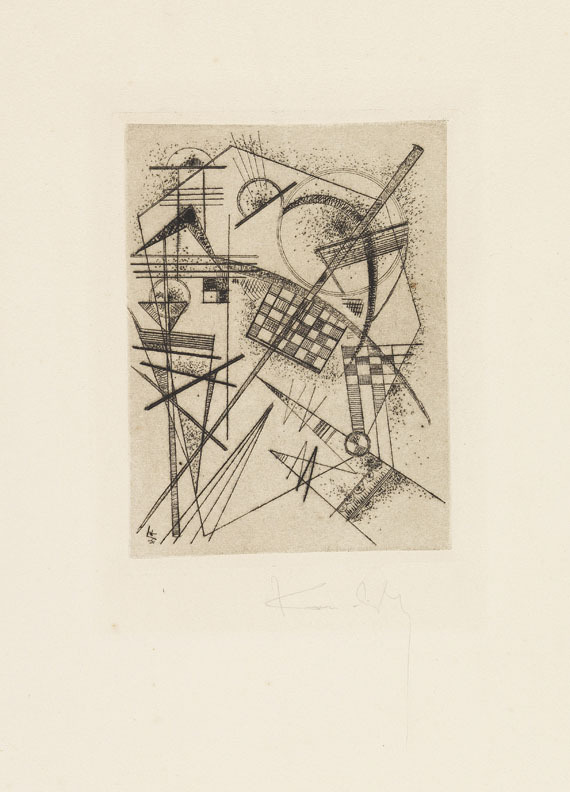 Wassily Kandinsky died in his adopted home-country France on 13 December 1944.